Education Secretary Justine Greening paid a visit to a local business and a school in Sleaford today (Monday) to see shining examples of apprenticeships and grammar schools at the heart her strategy for education. The Secretary of State for Education was also here to support Dr Caroline Johnson, Conservative by-election candidate for Sleaford and North Hykeham. She first met with Matt and Kate Cook, directors of Butlers electricians on the enterprise park at the edge of Sleaford. There she met apprentice electricians who have been going through the company’s training scheme, as well as touring the premises of the growing family firm. She then moved on to visit Kesteven and Sleaford High School to see a grammar school in action to see how its success can be shared among other schools locally and nationally. She is the latest Cabinet minister to pay a visit to the area in support of Dr Johnson’s campaign, after International trade Secretary Liam Fox visit North Hykeham on Saturday to discusss the construction business and housing policy, Transport Secretary Chris Grayling visited Great Gonerby on Thursday to talk about transport and improvements to congestion on the area’s roads and Nick Gibb, Minister of State for Schools, visited Sir William Robertson Academy on Thursday. Mr Gibb spent considerable time chatting to pupils about their career aspirations and about their thoughts on democracy and the current system before embarking on a tour of the school. Mr Gibb then discussed the fairer funding for schools issues with Mr Mark Guest, the headteacher and Brian Lucas, the chairman of Governors before heading back to London. The school was recognised earlier in the year as being one of the ‘Top 100 non-selective state-funded schools in England’ and congratulated by Mr Gibb in a letter to Mr Guest. Dr Caroline Johnson is a local doctor from Sudbrook who will be standing in the by-election following Stephen Phillips MP’s resignation of the Sleaford and Hykeham seat which he has held since 2010. UKIP launched their official by-election campaign on Saturday in Sleaford led by candidate Victoria Ayling. 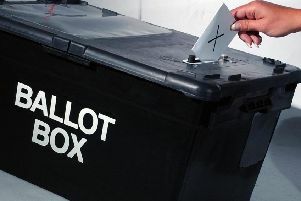 Also standing in the by-election are: Jim Clarke (Labour), Ross Pepper (Lib Dem), Marianne Overton (Lincs Independent), Sarah Stock (Ind), Paul Coyne (Ind), Peter Hill (Monster Raving Loony Party), David Bishop (Bus Pass Elvis Party) and Mark Suffield (Ind) although Mr Suffield’s family have announced he will not be actively campaigning due to ill health.